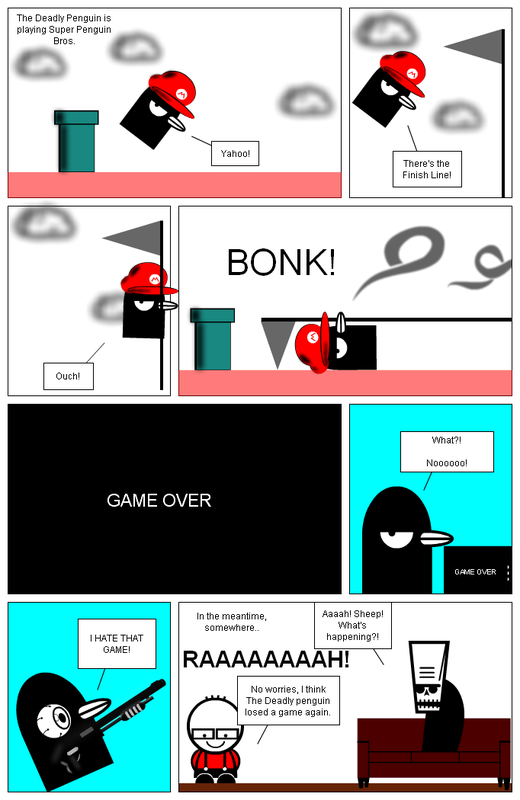 Stripgenerator.com - Super Penguin Bros. I've made a Mario hat and a pipe where Mario always is going in.. I want to thank Netrunner, SnakeYukin, 35sheep and Zoltar for this strip. The shotgun is made by Netrunner. The sofa is made by SnakeYukin. And Zoltar isn't made by Zoltar, but who cares? The Deadly Penguin is playing Super Penguin Bros.
No worries, I think The Deadly penguin losed a game again. lol. super penguin. how do you paint? i cant! Don't hate the game, hate the player... what... I got that mixed up. Alright, carry on.